As I reflect back on the past few weeks and the terrible tragedies our world has suffered because of senseless acts of violence, I’m reminded of the fragility of life. 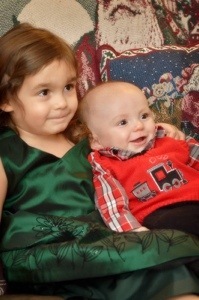 The preciousness of my two beautiful, healthy children. Listen lady, In whatever way you celebrate, I hope everyone is reminded that the holidays are not about the gifts we receive this year, but rather the loved ones who surround us that make this time special. There are too many families, torn apart by violence, who are not as lucky as us and my heart is heavy for them. Whatever your stance is on gun control or mental health, (no, this isn’t the forum so please don’t comment) I think we can all agree there is a serious issue that needs to be addressed. From the Listen Lady family to yours….wishing you a Merry Christmas and a safe and prosperous New Year!